For the publishing purposes for Training-Online.eu learning management system (LMS) to deploy e-learning content, you'll want to use the LMS option publish settings in Adobe Captivate SCORM editor. * Data to report - set Quiz score / percentage and mark Interaction data. Training-Online LMS system results evaluation is based on the percentage values returned by the scorm package. * Required - the usual setting for our LMS is the Optional where the user may skip. 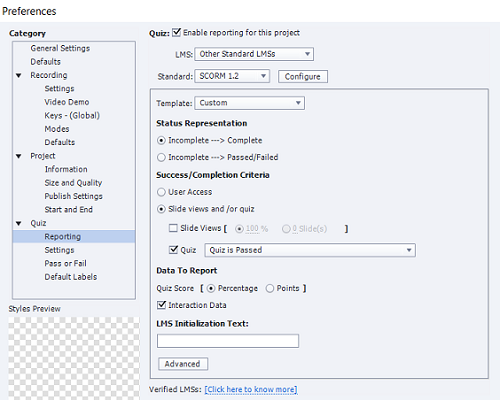 This option rely on the fact there is the Score set in the LMS course parameters. You may also set other options but they are more internal package setup. Training-Online LMS sets the completion score based on the percentage reported by the package. Reporting of score and interactions is performed at each monitored activity and stored in the LMS. The higheist score from any trial is captured. * Objective ID - field is a unique string of characters assigned by Captivate. Your LMS uses it to identify your content. * Shuffle answers - you may check for the cases you want mix the answers of each particular question at each time when the answer is displayed. * Submit all - all questions will be required to complete before test final submission. You may also adapt the messages that will be shown to user. * Show Score at the End of the Quiz - mark for cases you want to provide the final quiz statistics to the user. 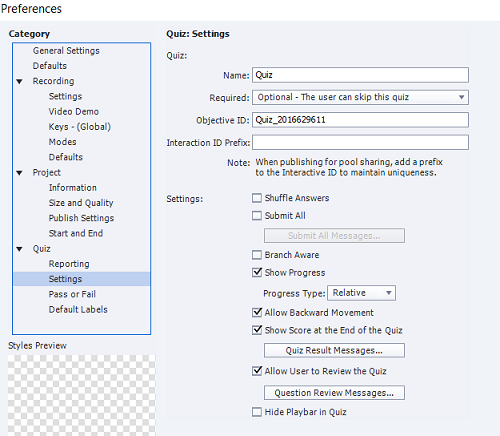 You may also modify the Quiz Results messages. * Allow user to Review the Quiz - mark for cases you want the user see the right answers. You may also modify the Question Review Messages. 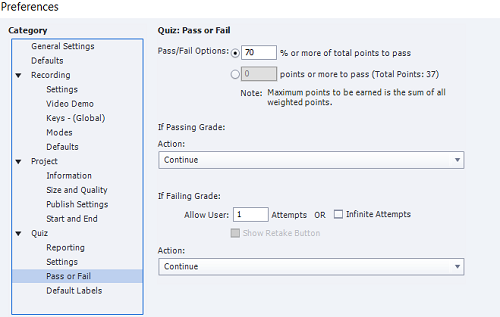 * Pass/Fail Option - set the % score and set the level you desire to have for the course completion. This value is the overtaken when importing to lms system, in case you choose the option. You may load the score and time from the scorm package when creating the lesson. You may either to change the score in the lesson entry, the lesson will turn to completed once the reported score is reached. - Allow user - number of attemts or infinite atttempts. Bear in mind that now you are settig up the scorm package internal number of attempts (views). As your lms system supports to set the number of trials (open of the scorm package), the total number of views is then the multiple of both parameters. Use the link to Create SCORM Lesson. Edited 5 time(s). Last edit at 01/28/2017 06:07PM by admin_admin.